rocketjohn: audio is reversed yes. LRRbot: Next scheduled stream: LRRMtG (James and Ben play with Magic Cards. Game: Magic: The Gathering) at Thu 02:00 PM PDT (2m ago). Laurence72 subscribed at Tier 1. They've subscribed for 21 months, currently on a 21 month streak! Laurence72: Blackjack! Woo! That means this sub pays me times and a half what a normal sub does, right? ProScubAntiScubDebateTeam subscribed with Twitch Prime. They've subscribed for 28 months! tastethebeams subscribed at Tier 1. They've subscribed for 26 months, currently on a 26 month streak! Elfowlgirl46 subscribed with Twitch Prime. They've subscribed for 19 months! alpsumtg: is the audio always this low? LJHero: is Ben coming later? EnoTheTonberry: Artichoke Salmon and Asparagus. lifecharacter: The intro exists in a state of transcendence. Always high and low and perfect and stuttery. Hingadora: I'm turned up to 30 volume when I'm usually at 20 volume. After you turned things up, now you're a reasonable volume? IbunWest: I can only take so much of Esper control before I get bored. EvilBadman: Arena code STARTERSTYLES unlocks 6 cards and one sleeve. ashleypg subscribed with Twitch Prime. They've subscribed for 17 months! moosethatsmiles: Will you be drafting cube today? Hingadora: My FLGS got burgled last night. From the pics they posted, it looks like all their MtG singles got swiped. lifecharacter: Meteor Golem, definitely not destroying the land there. alpsumtg: why didn't they choose like decent commons or uncommons..? StageMgrRob: Are you doing a PPR? BloodnBullets: i think you can set a default on in profile right? timiam subscribed at Tier 1. They've subscribed for 35 months! timiam: The sleeves are on your shirt, James. Sibwow: how did you get the NPE loot? onyxseeker subscribed at Tier 1. They've subscribed for 8 months, currently on a 8 month streak! Sibwow: now buy the rakdos premium art? EnoTheTonberry: It's all because of your dilly bars. Wangor: Might be time to ask Wizards for your cut of the profits. Sibwow: estimate: 5k people back into magic and 100 dollars each means 500k? deyja429: Take the Blightning effect. Wangor: Scotchmark, for the whisky lovers. Wangor: Juggler? I barely know 'er! lifecharacter: Vampire's an infiltrator, but with lifelink. samiyenas: I think that enemy got, the point! ChangelingDruid subscribed with Twitch Prime. They've subscribed for 8 months! CharlieBronson86 subscribed with Twitch Prime. accountmadeforants: Oh yeah, I was inspired by the guy who beat you at the start of your previous stream. And managed to draft the Goblin Gathering + Cavalcade dream a wee bit ago, went 7-2.
cmdrud87: Are those guildgates available in paper to normal people, btw? flatluigi: it's your card, gutterbones! surfderf subscribed at Tier 1. They've subscribed for 6 months! surfderf: 6 MONTHS!? That's almost 7 months! Hingadora: Gods, those card styles are disquieting. Something about the motion is just kind of anxiety inducing. EnoTheTonberry: See if you wanted flyers, you should replace those mountains and swamps with plains and islands. Why are you even playing them in an Azorius Draft? Unas84: hey @LoadingReadyRun , is it ok if I try to get matched against you again? NathanJay_GA: fireblade might come back? lifecharacter: Everyone quick, take an 8 minute break to go listen to the song. Hingadora: Did you want to change your sleeves? karlmartin001: Tin Street Dodger is a cut I think. Not enough spectacle to be worth it. flatluigi: side in slinger for flyers? Sibwow: a cool sleeve would be "played on concrete and now creased and old looking"
Mushbie: does anyone remember what the code James used was? Trixalicious: If you zoom in to your library you can also run the mouse over 8 or so at a time. enjoysgreatstreams: cool nice Rakdos deck! EnoTheTonberry: Is that Bengineering, in the Flesh? TheR676767: how was ttc ben? samu_btdp1985 subscribed at Tier 1. They've subscribed for 21 months! Wangor: Ben, that is an excellent shirt. deyja429: Are cool tech cards coll technology? TheR676767: we're on like a 5 ish turn clock, right? nylus826 subscribed with Twitch Prime. They've subscribed for 30 months! Lord_Hosk: Hey James, who is that handsome boi next to you? Lord_Hosk: Hey Ben, who is that handsome boi next to you? BobaRobes subscribed with Twitch Prime. They've subscribed for 14 months! kynelwynn: Adam brings the crew and Ben brings the Flood? Wangor: Get back the imp! Baldrash: It'll always be #BlameWorth. 1losttheGame: but we can keep the imp no matter what! lifecharacter: Throw imp away. It might die anyway. BolshajaSvinja: Throwing doesn't do anything? Koshindan: They would have to block the 5/5 anyways. BolshajaSvinja: But if you attack with everything they need to block 5/5 anyway. Assuming no removal of course. Ashiok_Nightmare_Beaver: what was that sleeve code? 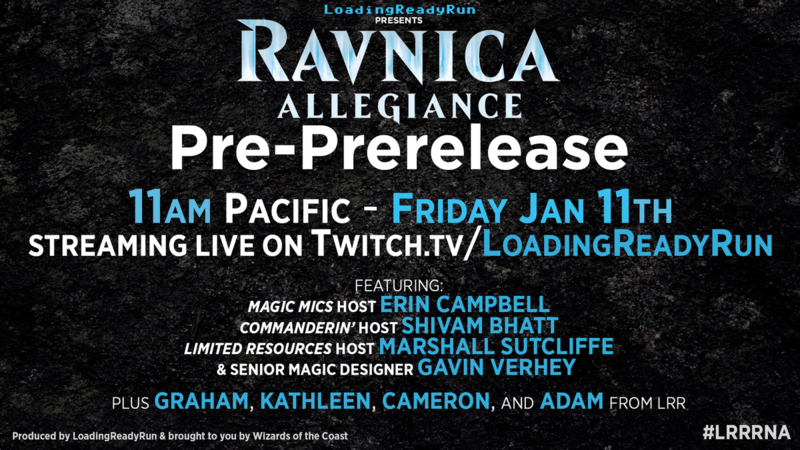 CardKingdom: @LoadingReadyRun Slidiing into your DM's...in your chat, to let you know that the newest buttons are live! Tap, Tap, Unsleeve. itsxbacon: I'm confused why he didn't play Rakdos? vegetalss4: Ooooh, new buttons, fancy. Wangor: Phew, that was a rough game. 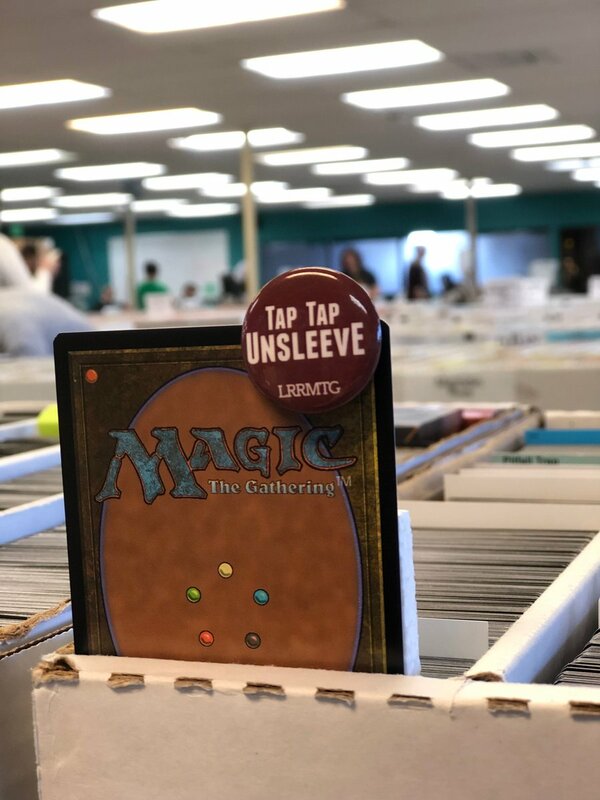 CardKingdom: You can get a photo of the button over on our Twitter account! kynelwynn: "It's a Kingdom of Cards"
queenfounder: Pay them so they pay us! lifecharacter: Have they let Wheeler know his buttons are live? ZachtlyAsIntended: Card Kingdom: I hear they're a store with a cafe that no longer sells a ginger/basil/orange drink that I really enjoyed. timiam: That's a very specific thing to hear. 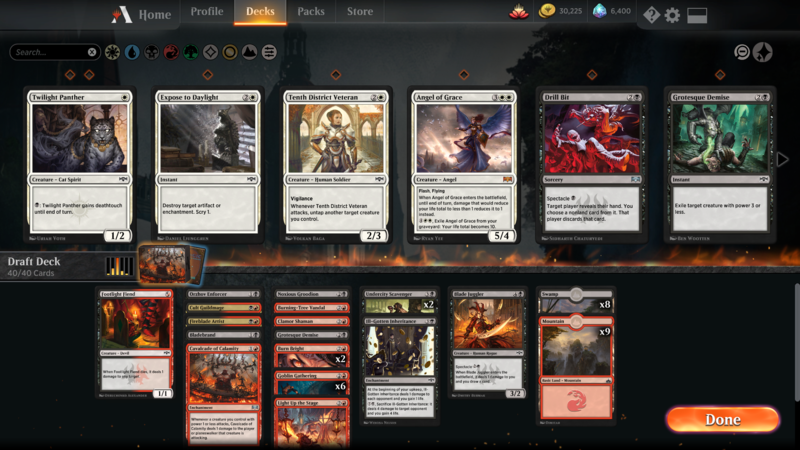 accountmadeforants: Gruul and Rakdos are both great in this draft, but I still want to live the Jund dream. carlospedroart: Screw the invitational this is where the REAL action is! EnoTheTonberry: How is American Gods? queenfounder: What's coming up on Arena after RNA? Guilds again? jonasjonIV: just noticed how cool your gate is! itsxbacon: Been thinking about sending my original Nog and Valencia painting to you, Ben. would you like it? themcclintalk: Is that a JoJo Reference!? BloodnBullets: i feel like OP is probably having a bad day. malexus101: just finished to watch out friend Amy get into top 16! how we doing? 1losttheGame: we are winning again! TehAmelie: if you could just pull a Sulfuric Vortex out of your sleeve right now and play it, would you? ZachtlyAsIntended: It was a blowout too, she BURNED EM! lifecharacter: A good player never let's the style happen. Sjcalnan subscribed with Twitch Prime. They've subscribed for 8 months! kynelwynn: what was the code? Sleevestyle? majidmalka997: is this game free? EnoTheTonberry: @majidmalka997 Yes it is! trespunto14 subscribed with Twitch Prime. lifecharacter: Who needs 4 lands. malexus101: never didn't have it? queenfounder: Their 5 lands aren't exactly helping out. WHy needs them? metalmaster1312 subscribed with Twitch Prime. malexus101: tin street badger, you say? tratta: are they playing oathbreaker on fnpf? WingsOfTheLost subscribed at Tier 1. They've subscribed for 63 months! malexus101: what is oathbraker thing? KartoffelKaiser: ok so they have at least one creature. queenfounder: How do you hold all those answers? timiam: Is this an official thing or community-made? flatluigi: does the signature spell go up in cost? malexus101: color identity is given by? Voidhawk42: So, I've yet to see anyone else using the sleeves on Arena. Can you even see your opponents skins? Papperslappen: TehAmelie Bitcoin rank, is that somewhere between junk bond and fools gold rank? chesul: do they both go up at once, or each seperately? mjfsixteen: is Serge gonna play kitchenfinx? KartoffelKaiser: Yeah counterspell is only good *because* it only costs 2.
malexus101: so you are saying I should play koth? Perchipy: signature spell sounds like a thing that can be broken if the spell has alternative costs. chesul: also, can you use alternate costs for your signature spell? thirsty_kitteh: I feel LRR should have a Kitchen Finks house rules for Serge. chesul: so, FoW is banned then I assume? chesul: tratta or Armageddon. just load up on rocks. TehAmelie: think we're gonna win before they can steal something with eyes Everywhere? abzan_trash_panda: I regret teaching James that now. malexus101: Elspeth+Geddon/Cataclysm can be fun, right? ryder0802: Just tuned in, what's happening tomorrow? thegrolan: Standing near the point does nothing! Stand ON the point! RabidWallaby84: Hey! Time to watch some GOOD Magic content...after sitting through that swill on WotC's stream. TehAmelie: how does it feel to have all these answers? itsxbacon: Nap time for Ben! Traion: Hey Chat. Haye James, hey Ben. Have we spread the good news about Amazonian yet? hunkajunk: Ben! James! You're not at Pax! Does that mean I'll see you at GP Calgary? jonasjonIV: if they don't kill it, I be they plan to take it. thegrolan: Serge's signature spell is crop rotation, calling it right now. Geekscience: this is my first stream; how the hell do you get the cards to show up when i hover my mouse over them on stream? malexus101: So Liam in in Greenland? ampharos15: So is the signature spell an instant or sorcery? chesul: they have stealing mana. Dandinstorm12: do we have a skewer? KartoffelKaiser: That's a dog from me, yikes. TehAmelie: is it three or four timezones? ZachtlyAsIntended: Newfies have their own timezone, if I recall correctly. malexus101: also, almost less than half population of Italy! queenfounder: Guess I forgot how much wider Canada is than the U.S.
rarermonsters: Which other end, East or North? thundervoice_1 subscribed with Twitch Prime. They've subscribed for 15 months! ThePerrBearr: pacific, mountain, central, eastern, atlantic, and what else? fcg_shadow: play to your outs! thedepthandbreadthofseth: they dont have the ones the us has in alaska and hawaii, but theybhavenextra eastern ones for like newfoundland and labrador. MAPBoardgames: Pro tip: NEVER concede. Artik_Skarab: Question, why do the profile pictures keep changing every game? timiam: Eat a fish, ben. deyja429: Eggs are also healthy and easy. timiam: @ Ben, if you drink pre-workout, what is your preferred flavor? chesul: it's an annoying deck, I agree. EnoTheTonberry: you know what's delicious? Spiders. hunkajunk: You dont' want to have a Mayonegg? malexus101: eggs are great as long as the yolk ain't solid! fcg_shadow: I eat 4 eggs a day and my cholesterol is fine. KartoffelKaiser: Hey, if eggs are good, then that means french toast is good because that's just bread and eggs. FoxFyr: @queenfounder pouches? Is this robert leifield makes eggs? margieargie: @NathanJay_GA I know what you actually meant by that, but my first reaction was still "an omlet?" illmastershogun: My normal breakfast is a breakfast burrito with ham, cheese, scrambled eggs and baby spinach. Tasty and not too bad for ya. malexus101: my normal breakfast is tea and biscuits and I feel like I go too light on it now. tehcrow7 subscribed with Twitch Prime. They've subscribed for 27 months! NathanJay_GA: @margieargie *stoner voice* but like... what if a burrito, but the tortilla... is eggs? queenfounder: For breakfast I have lunch. I just still haven't been able to stomach eating when I get up. KartoffelKaiser: Fruit is nice fast healthy breakfast. Grab an orange or an apple or something. Mister_Hush: We all should try to be more like Adam Savidan. jonasjonIV: Gotta pull Adam's weight. And he is full of big brains. Lord_Hosk: The instructions say to cook this chicken for 22 minutes at 400 degrees, so I just left it on the counter, at 70 degrees for 2 hours... same difference right? ShepDM subscribed at Tier 1. They've subscribed for 50 months! JaymicUnyielding: hello friends! how goes the Magik? KartoffelKaiser: I see opponent has selected shaman. dr0ne00000: @KartoffelKaiser the king of potatoes has a cereal question - everyone pay attention! SirRebralPaulsy: why'd you leave sol ring on top there? thegrolan: A real job? In this economy? ryder0802: Don't ever leave Ben! fcg_shadow: even languish would be fine. KartoffelKaiser: what is this rdw? MTGDiversity: oooh do we have daggercaster / bladebrand combo in this deck? hunkajunk: Ku! you did the thing! are you still going to Seattle? KartoffelKaiser: @TehAmelie I would tend to agree, but a group of my friends cooked a turkey by cooking it in half the time at twice the temperature. They periodically covered it in water so it wasn't bone dry. To this day I am mad that it worked as well as it did. NotCainNorAbel: I'd like to move to Canada. Subscribetostayrospet: hello guys just stopped by to say you are amazing keep it up! theclawmasheen: I can't see that card without hearing Adam's voice. Tantaburs: has this dodger done all but one of our damage? KartoffelKaiser: dr0ne00000 college students lack the dorm space and cash for a turkey fryer, but I would tend to agree. DiscordianTokkan: Pop it AND locket! WonderfulGlory: I bought bits to issue challenges to people playing Sekiro. Let see if Adam can earn those bitties! KartoffelKaiser: If you have mono locket, please see a physician. hunkajunk: Ahaha! you played right into Kaya's wrath! tratta: ben have u ever made a pauper edh deck? queenfounder: Would pauper edh need an uncommon commander? Dread_Pirate_Westley: You could use an unccommon for a commander. thegrolan: Ben have you heard of Peasant? It's Pauper with uncommons instead of commons. KodeMage: cam's pauper commander is different from what most people mean by pauper commander. Dread_Pirate_Westley: Happy Opening Day of the Best Type of Sportsball! KartoffelKaiser: That unplayable legend from the set Legends. So a legend from Legends. fcg_shadow: are there any common ledgendarys? rarermonsters: Peasant sounds really pointless to me, because why have a budget format where Force of Will is legal? thomturtle: Wow, this is rude. KodeMage: cam is playing a commander deck that's all commons, "pauper commander" is any uncommon creature as the commander. keymaster515: But Pheasant has really broken cards like Sensei's Divining Top. FoxFyr: 100 Put in my two weeks notice to my "real job" on monday so I can focus on my freelance work and art and learning python and you guys were a big inspiration to take the leap! So thank you! EvilBadman: there's 12 common legends. From Legends. thundervoice_1: @LoadingReadyRun Ben, any chance of doing something with Card Kingdom's Battle Decks on FNPF? HolyFroq: Is the Preprerelease Date already out? KodeMage: send it at the face! NotCainNorAbel: @FoxFyr You can do it! KartoffelKaiser: Sac it next turn and replay it. malexus101: didn't you had lethal there? FoxFyr: thank you @NotCainNorAbel ! malexus101: because you cannot go back once you open a stack! kumatsu: we can cycle gutterbones and Fireblade Artist every turn? funsizecyclops subscribed with Twitch Prime. They've subscribed for 8 months! thundervoice_1: @LoadingReadyRun Is there any chance of a FNPF using Card Kingdom's Battle Decks? Dread_Pirate_Westley: Swing all and win. Dandinstorm12: can we kill them? coachNelly: Cast all your spells and attack! FoxFyr: If Ben can move halfway onto a continent to be a streamsman than I can do the thing! KartoffelKaiser: @jclem_2 its ok, your opponent was playing rubble reading they probably lost their next game. EnoTheTonberry: Did you burn down lizardmen? KodeMage: I wouldn't make it over the mountains, not enough air, would be dangerous. tratta: Will they spread planeswalkers to other rarities or am I too hopeful? margieargie: But did you also go through a forest and swamp? Voidhawk42: But did you go through a Swamp and a Forest? dr0ne00000: but isn't your island like Innsmouth? xippih: What are your favorite decks in standard right now? FoxFyr: This may not be the appropriate place to ask, but when will Desert Bus volunteer opportunities/positions be announced? MrTheWalrus subscribed at Tier 1. They've subscribed for 23 months! MrTheWalrus: Glad I could catch a bit of this stream. Looking forward to seeing some of the rest of the crew at PAX this weekend. LRRbot: Next scheduled stream: Tinker Tailor Solder Fry (Ian and Paul start work on Tally Lights.) at Thu 06:00 PM PDT (2:34 from now). KodeMage: seen the Mythic Invitational at all? It's all Mono Red and Esper control all day. thegrolan: Ben how do you feel about aristocrats in standard rn? CyanMig: do it now in case of counters? PressStartToFinish subscribed with Twitch Prime. They've subscribed for 24 months! KartoffelKaiser: @jclem_2 I really like rakdos aristocrats in this format. All the 1 damage pings just hose so many archetypes. Abavus subscribed at Tier 1. They've subscribed for 19 months, currently on a 19 month streak! Abavus: Have you ever thought about how many hours of productivity have been spent wriiting resub messages? tratta: do u think that planeswalkers will be moved to other rarities? Donutholez: gate decks run counters? do they have everything? even the kitchen sink? wierdo_of_OZ: is this a draft? PressStartToFinish: One of the most entertaining games I saw on the Mythic Invitational today was Naya Angels. thundervoice_1: Ben, is there a chance of playing Card Kingdom's Battle Decks on FNPF? malexus101: for my Mardu experience it's probably the best as Mardu aggro! KartoffelKaiser: I've been trying Rakdos Aristocrats as an aggro deck. Open with aggressive beats and shift into aristocrats/burn once your opponent stabilizes. dr0ne00000: @Abavus you're not my supervisor!!! thegrolan: Their cat might pee on their keyboard! queenfounder: All your ideas have been great so far! malexus101: Ben, top 3 PW you are excited to see cards for in WAR? Donutholez: when will you guys play with the coldsnap pre-cons? PressStartToFinish: One of the MTG articles specifically said Elspeth is not in. Robot_Bones: is it not one of the chinese deck planeswalker? lifecharacter: Elspeth's "Dead". More importantly, Ashiok is still very much existing. DoktorNik: I really want a 1 mana karn with a single -1 ability that reads "Kill Target Teferi Planeswalker" so standard can be fun again. FlameI7: The lady in the hat is ostensibly, "The Traveler"
malexus101: Vince (pleasant Kenobi) had a pretty nice love-based argument of why she shouldn't be there! irishcoffee586: where does one go to learn the lore behind all the cards?? tratta: Will there be planeswalkers of different rarities? chesul: we;re not just dead this turn. KartoffelKaiser: @tratta we have absolutely no information about that yet. thundervoice_1: Are you expecting there to be more planeswalkers than have been revealed, with a guaranteed planeswalker in every pack? Fugi: did we just lose every flip what? tratta: once i played a rakdos and nothing happened... i died the next turn. irishcoffee586: oh awesome, thanks for the link!! Trixalicious: you're just almost dead. EnoTheTonberry: Are we playing Fliers? HailtheRNG: do we consider possibly being azorius? lifecharacter: Declare your heart's truth: Dovin is a cutie. PunkRockZoologist: 200 Tried to talk to my mum last night about the importance of they/them pronouns and it didn't go great, so I'm glad to have you guys to hang out with and see the best in people. ZachtlyAsIntended: SO much Cavalcade deck in these packs! jonasjonIV: just go right to simic. laskotheking: Greetings to Ben and James! zuchen_120: Was that a fancy guildgate?? aura0fdeath: we're a little short removal, no? KartoffelKaiser: Lockets are really good in this format. EnoTheTonberry: Holy crap, where did the gates go? dr0ne00000: didn't you draft gate stuff? BloodnBullets: there was another goblin gathering! GolgariGlenRoss: Not playing that angel? Dread_Pirate_Westley: I'd rather have the Croc than the blade. andy_reeed: Hi Ben, just received my CanLander deck, and it’s hella fun to play! Thanks for introducing me and I assume many others to such a great format! lifecharacter: Archway with no gates is pretty meg. KartoffelKaiser: Archway is still a 3 power flier. That's still fine. KartoffelKaiser: Flying is a broken mechanic. columbaceous: :0 how did you get those? StrangerColin: how do we get the sol ring sleeves? coachNelly: Is second locket better than third imp? Mister_Hush: Oh my, LoadingReadyRun making controversial statements like, "people are people and should be treated with respect." How ever will they recover from the internet blowback on that one?! KartoffelKaiser: Oh I'm never taking that trade there if I'm opponent. That 2/2 is gonna be a 6/6 later. itsxbacon: Just about every other language has a gender neutral singular pronoun. ellgieff: @itsxbacon English has a gender neutral singular pronoun. Lord_Hosk: English has the neutral pronoun too, society has just moved away from using it. cuttlefishman: Ben, can you describe how James is playing? PiousHeathen: Holy moly. I just discovered the new overlay features. That is sweet. Feminine_Desires: So I'm lurking while I try and figure out how to get all the arena animated styles into tappedout. lighting_bolt_123: I put a biogenic ooze into play with that in draft , it felt great. ThePerrBearr: was that kathleen laughing? KartoffelKaiser: Ok, so we have a good life total here. IGI would bail us out here. disciple007: @LoadingReadyRun you guys get to watch any of the invitational today? Alexis_Aehale: Just wondering how old is ben? lighting_bolt_123: where's the skip button ....lol jk jk. Uzumaki15: @loadingreadyrun how did the Rakdos draft go? I missed most of it. korvys: Chat, is there a list of PAX East panels thay have LRR people on them? ZachtlyAsIntended: Clearly, Tenacious D played the best song in the world. ChaoticUndercurrent: when is the next PPR? ZachtlyAsIntended: They recorded a tribute to it, but they played the best song in the world...they just can't remember how it went. KartoffelKaiser: Still good for us. deyja429: Xichor and the War Boar? KartoffelKaiser: That angel has flash, and they do not have blue mana. KartoffelKaiser: I would ambush them with it. flatluigi: oligarch, leave bladebrand and sac mana up? KartoffelKaiser: Pontif is also a good line here. somewhatclever_: Dear Dr Bengineering, so you think that a edh could double as a viable Canlander deck? In this case mono G stompy. LRRbot: The stream has been live for 1:53:06.
peacehomie: Hey will the upcoming set rotate any standard sets? flatluigi: IGI means you're winning! LRRbot: The stream has been live for 13:12:43.
queenfounder: What does the updog number relate to? How much the stream has been live all week? peacehomie: Do you think arena will ever have real drafts with people? peacehomie: Or even sealed events? PressStartToFinish: @queenfounder How long the stream has been live in dog years. queenfounder: @PressStartToFinish ah, thank you, duh! LRRbot: Next scheduled stream: Tinker Tailor Solder Fry (Ian and Paul start work on Tally Lights.) at Thu 06:00 PM PDT (2:01 from now). carlospedroart: That was so clutch. KartoffelKaiser: wait chat lethal was actually lethal. This is a momentous occasion. deyja429: Foil=best 4drop that is not cast for 4mana. queenfounder: So people who made mythic in Feb are better because they had less time? BloodnBullets: deckmaster is great, thanks @Fugi ! silenceaux: he just call you a snack? TehAmelie: i like "magic cop". it works better than "fun police"
ZachtlyAsIntended: Longpork is people too! MagnusCarter: Yeah, Just found that I can stream at 160p and use deckmaster to read the boardstate. HesGotNoPants: that fog of love bleed into real life a bit huh? rasterscan: James is cold as ice. LiveFaust: Did Ben just "United States of Whatever"? Alexis_Aehale: Is being friends with James like having brother from another mother? Lord_Hosk: advanced card identification software for a cardgame that wouldnt be invented for another 15 years and a computer progam that was 40 years out clearly ZachtlyAsIntended it was very advanced for its time. KartoffelKaiser: Hey spewer can get saced for value. Alexis_Aehale: orzhov for the win. KartoffelKaiser: It can also be used to go out on your own terms. EnoTheTonberry: Are you saying that James is your sugar daddy? KartoffelKaiser: This is so awkward. Texan_Reverend: DB9 was a good year for meeting people. KartoffelKaiser: This is marginally better than our 7, but not by much. ZachtlyAsIntended: @Lord_Hosk For a streaming platform for a global service that wasn't nearly prolific enough to warrent programming for. AKA: It was made by a timetraveling Fugi as prep. Alexis_Aehale: sorry i am new to this what is desert bus? Texan_Reverend: That was when Dix and Lindsay met in person, and it's when L and I first met online. Gurtperk: Shout out to Nog and Valkencia! Can't wait for more Dice Friends! KartoffelKaiser: Strap in. Buckle your seat belt if your local bus system has those: Desert Bus is a heck of a thing. silenceaux: Las Vegas to Tuscon? Alexis_Aehale: Thank for the info. TehAmelie: you can see the whole week on Youtube, for i think at least the past 6 years? ADTalks subscribed at Tier 1. They've subscribed for 9 months, currently on a 6 month streak! PunkRockZoologist: Wow! That's an old video now, Ian still had hair. MagnusCarter subscribed at Tier 1. They've subscribed for 18 months! MagnusCarter: Just stopping in to sub from PAX. Good luck! korvys: Oh! Speaking of Desert Bus, James, is your email just James (at) LRR (dot) cc like the others? Skajetolaf: As you guys grinded to mythic in record time, shouldn't you have been invited for the invitational? kumatsu: I know it probably comes up too much, but has there been any news on public release of the Desert Bus doc? Trixalicious: So you're in the non-canon invitational then? korvys: Oh, you mean Adam? mastershake29x: what? are we saying that FN isn't a documentary? KartoffelKaiser: Look Pro Tour Alex's Kitchen happened and I refuse to accept evidence to the contrary. KartoffelKaiser: oh huh there goes all our attacks. Right over there. DarthRagnar815: That birb is swol. CyanMig: ive just used that code to get some basic cosmetic cards, do they auto update my decks or do i need to swap them in or something? Feminine_Desires: in deck building, there's a little sparkle circle in the top right next to the deck list. CyanMig: ty! ill search for the button! Feminine_Desires: I'm working on getting these animated styles onto tappedout. KartoffelKaiser: It's pretty much all Esper, Mono red, selsenya aggro and white weenie. KartoffelKaiser: poor midrange has basically no representation. Feminine_Desires: This is honestly one of the reasons why I don't like orzhov, the average orzhov creature is just so weak in terms of P/T. Feminine_Desires: Simic, azorius and gruul all outclass them in P/T. Giddyalloy: Love you Friday night show so decided to check out your twitch!!! KartoffelKaiser: What I like about Orzhov is that they are very good at trading up with Gruul's creatures. Unfortunately they are not great against decks that are not gruul, and gruul is not more than 50% of the format. PunkRockZoologist: Why are sleeves a thing in a digital format with no physical cards to get damaged? Houseboy23: Where did the he ajanis pridemate get spoiled from? Earthenone: i wonder if enough of us put "disregard commons" in the text box wotc will import your sleeves? disciple007: WHY DO I BUY FOILS FOR COMMANDER? KartoffelKaiser: Look if my play group wasn't so unreasonable about it I would play with top loaders on all my cards but no, that's "absurd" and "can't possibly be shuffled sufficiently." Feminine_Desires: IGI here I think? LegionLoyalist: there's a gate? gate deck open! KartoffelKaiser: Leading with a CCDD card is risky. Lord_Hosk: Hallowed fountain thats like a 10,000 gem card! silenceaux: I'm pretty sure that of the CCDD cycle Firewheeler is the bottom? Blasteg: are you two doing a double-blind dco-op draft s well? carlospedroart: high alert number 2!! korvys: What's with these borderless gates? Feminine_Desires: Why not the kitty? KnBofink: since when is James Bens servant!? KartoffelKaiser: Panther could have made our deck, but we have better spells. queenfounder: Do we need 2 tethers? ogundiety: Is James just not talking? ArcticAtlantic: is it worth having black in here? Billyfred001: whats the code again? KartoffelKaiser: Ok this looks good. EnoTheTonberry: Have you ever seen Ben and Adam in the same room? KartoffelKaiser: Well, decks with no black mana are not IGI decks, I guess. TheMicah21: give all the creatures names and back stories Ben! KartoffelKaiser: As it happens mulliganing is good in this game called Magic the Gathering. KartoffelKaiser: We have, in fact, played ourselves. queenfounder: Is that more silly than double unblockable? KartoffelKaiser: I like reading story synopses of comic book story arcs. KartoffelKaiser: It's a good compromise. chesul: you can still attack with the currier. dacardczar: Why not attack with courier? dr0ne00000: @queenfounder you googled butts? chesul: it has defender, you have high alert. queenfounder: @dr0ne00000 yep, then I researched deck lists! Lord_Hosk: every time a friend of mine is like hey you like survival games like Oxygen not included and dont starve right? you would love X, and I think , how many thousands of hours do you think I have? GolgariGlenRoss: High Alert does have quite a lot of text on it. KodeMage: JAMES! Ben can't read cards! KartoffelKaiser: Let them spend 2 cards to kill your 3 drop. PruPruh subscribed at Tier 1. They've subscribed for 33 months! PruPruh: You are almost as big of a goofer as you are handsome and friendly. Of course we won't tell on you. Narrator: That was a lie. KartoffelKaiser: We are the beats. AalderFlawn: When in doubt, punch 'em hard. KartoffelKaiser: We can stop them from attacking here. chesul: now, if they have another sky tether they can do the theme play! CaptainSpam: Ben "Flying Tutu" Ulmer. KartoffelKaiser: Part of me really hopes that opponent has like 3 basilica bellhaunts in hand and cant cast them because they don't have double black. rocketjohn: doesn't matter when it does it... power doesn't change..
Donutholez: we need more mana for high alert. deyja429: We have a bounce spell? flatluigi: don't forget you can untap your griffin! KartoffelKaiser: It makes things both more and less confusing. chesul: rocketjohn but we still payed mana to it. Feminine_Desires: Meaning if you have tetsuko, your walls are now unblockable. chesul: rocketjohn thus waiting till then was the right timing. DoktorPiccolo: Why not give it vigilance? AalderFlawn: See Ben, this is what happens if you don't play Mono Red. A really boring game of magic. KartoffelKaiser: Death Touch? There's no death to touch! chesul: you're winning the race. Illisine subscribed with Twitch Prime. They've subscribed for 41 months! AalderFlawn: Deathtouch UN-Set. You have to actually touch the card when it blocks for deathtouch to work. PiousHeathen: why not give courier vig? Trixalicious: so is high alert + ethereal absolution = the plot of ghostbusters? PiousHeathen: oh rright. my bad. chesul: they sac'd a panther, which is kinda just worse. The_Ocean_who_Subbed subscribed at Tier 1. They've subscribed for 57 months, currently on a 57 month streak! KartoffelKaiser: Ok well we win. chesul: Ben, if you were talking about the afterlife, the spirit would have just died. queenfounder: WHY did that tap the black!? MacSquizzy subscribed with Twitch Prime. They've subscribed for 25 months! Beleqwaya: Wooo! Plat in constructed! Made it just in time! KartoffelKaiser: Does attacking with the spirit here change the clock? somewhatclever_: What is scheduled for the paper fight this week? KartoffelKaiser: We have many lines. AalderFlawn: You know that game would have gone faster if you drafted Mono Red. queenfounder: Why are you even running islands in mono red? EverestMagnus: Training montage to make the pro to;ur. TheWarbo: Yeah it's supposed ot be like "sibling"
EnoTheTonberry: Or you could go with "Brother's Child"
TheOneCalledStu subscribed at Tier 1. They've subscribed for 48 months! 1MrGhost: This is fine right? plays on turn 3... not great but not the worrst? CaptainSpam: If you have two nybblets, do you have a byte? dr0ne00000: @CaptainSpam little endian or big endian? Almost_Dr_Owl subscribed with Twitch Prime. They've subscribed for 15 months! CaptainSpam: @dr0ne00000 Depends on how old they are. AalderFlawn: Interesting to see Ben in Azorius, he always seems more like a Gruul player to me. Scar_Red_Tiger subscribed with Twitch Prime. They've subscribed for 34 months! TheWooglie: anyone else just get the Tom Cruise dance now? ZachtlyAsIntended: But are you an X-Force kinda guy? WonderfulGlory: Did you just have a stoke? AalderFlawn: But Ben, you always force Mono Red. Musicsquid subscribed at Tier 1. They've subscribed for 18 months! Musicsquid: Enjoying my week off work and I hope you gentleman are having a great day as well! drdudeman: @LoadingReadyRun Thoughts on the Mythic Invitational? Good? Bad? Needs Improvement? Kthanid subscribed at Tier 1. They've subscribed for 66 months! KartoffelKaiser: I really like the idea of an invitational that gets this much press. I really do not like the format. indianajo3 subscribed at Tier 1. They've subscribed for 36 months! zuchen_120: I think it started rough and got much better from there. It’s also hard to run a tournament at a place that isn’t just for magic?? flatluigi: attack with both and rally anyway? elderfishman subscribed with Twitch Prime. They've subscribed for 3 months! sithenin: When is the next ppr? Lord_Hosk: I feel like you are devaluing the nice a little James, its like when NPR talks about how the pledge drive can be cut down by an entire day, if you just donate early. but they talk about that for a month. nullrush is gifting 1 Tier 1 Subs to LoadingReadyRun's community! They've gifted a total of 1 in the channel! nullrush gifted a Tier 1 sub to jell22! queenfounder: So did you just not read the card there James? MugenHedgi subscribed with Twitch Prime. They've subscribed for 8 months! the_spider_bucket: James, cursing yourself was definitely not worth it. It was a power move though. flatluigi: bounce admonition, judgement the juggler? EnoTheTonberry: See what the new card is? RobocracyNow subscribed with Twitch Prime. They've subscribed for 33 months! EnoTheTonberry: I am in awe of the size of that lad. lucasbune: Yo, are you planning to draft cube on MTGO? korvys: roBOCracy, like Democracy, I assume. lucasbune: On or off stream? KartoffelKaiser: pizza can be healthy. Earthenone: what are you doing for stream? queenfounder: I'm having veggie pizza for dinner! KartoffelKaiser: If you make it yourself it's great. The big trouble with take out pizza is the grease. TheMicah21: what kind of sausage? Tiber727: Somehow, they both end up with sausage pizza. EvilBadman: Damn, turkledog, you got brinner?! BrindleBoar subscribed with Twitch Prime. They've subscribed for 13 months! queenfounder: How can I have put on weight? I've added a salad to every meal! PiousHeathen: My go to "I dont wanna cook" dinner is a sausage and some seasoned green beans on a pan, put it at 400 for 20min, turn, 20min, done. Tiber727: Spinach is nice on pizza. EverestMagnus: Just saw noticed the overlay for the first time. carlospedroart: Salad pizza. Chop some lettuce and tomatos, onion and all of that and then throw it out the window and binge a bacon lovers. chesul: Cashews are actually pretty great. Tiber727: Have you not had Greek pizza, James? ogundiety: I remember a super strange LRR video where Matt was ordering pizza for some reason. drdudeman: ANyone else think their mics are a little low? Or is it just me? Earthenone: was ben even alive in a pre internet world? Beleqwaya: I'm almost upset by that called shot. TheMicah21: couldnt the fiend ping a creature and lower its attack? or does it not work that way? drdudeman: @LoadingReadyRun Hey Ben any chance you are thinking about taking a turn being DM for Dice Friends? Beleqwaya: Game of Skill. Best Wizards always wins. LRRbot: Next scheduled stream: Tinker Tailor Solder Fry (Ian and Paul start work on Tally Lights.) at Thu 06:00 PM PDT (1:02 from now). LRRbot: Mesmerizing Benthid [3UU] | Creature — Octopus [4/5] | When Mesmerizing Benthid enters the battlefield, create two 0/2 blue Illusion creature tokens with “Whenever this creature blocks a creature, that creature doesn’t untap during its controller’s next untap step.” / Mesmerizing Benthid has hexproof as long as you control an Illusion. mastershake29x: the last 6 PM Pacific stream! queenfounder: It's also in an email to all of us! CaptainSpam: Commander Oat Breaker. Breaking oats, all day long. EnoTheTonberry: There are children watching this! LRRbot: Next scheduled stream: Tinker Tailor Solder Fry (Ian and Paul start work on Tally Lights.) at Thu 06:00 PM PDT (54m from now). cgwonder subscribed with Twitch Prime. They've subscribed for 2 months!